We used to set up portable tree climbing for birthday parties through Tree Top Builders, but that activity has grown into a separate company. 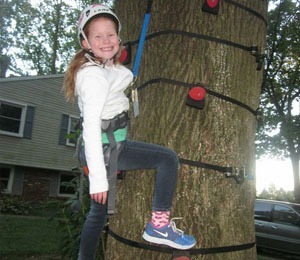 In 2015, Dan Wright, our founder, established Treehouse World, a treehouse themed adventure park in West Chester, PA. Treehouse World has permanent activities which allow them to offer more diverse events for much lower cost. Some events such as the bungee trampoline and archery tag are portable and can be taken to your location. But by hosting your party or event at Treehouse World, there is access to ziplines, treehouses, and more. Tree House Parties and Tree Climbing Parties! Treehouse World’s mission is to give people an amazing experience in the trees without having to commission a large project in their back yards. Treehouse World opened for tree climbing parties and events in May, 2015, and announced it’s Grand Opening in March, 2016. The plan is to add something new and exciting every year forever on it’s 14 acre wooded property in West Chester, PA.
Treehouse World has separate management and offices, so make sure to visit the Treehouse World website for up to date information and inquiries.